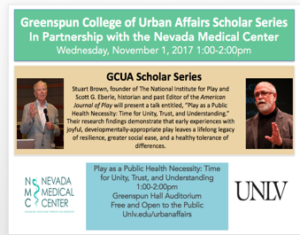 The Nevada Medical Center in partnership with UNLV Greenspun College of Urban Affairs presents “Play as a Public Health Necessity”, a lecture given by Dr. Scott Eberle and Dr. Stuart Brown in the Fall Scholar Series. The event will take place on November 1st at 1 PM. For more information about this lecture, please visit UNLV’s website.